Lorenzo Isella, Juliette Stehlé, Alain Barrat, Ciro Cattuto, Jean-François Pinton, and Wouter Van den Broeck. Journal of Theoretical Biology 271 (2011) 166-180. The availability of new data sources on human mobility is opening new avenues for investigating the interplay of social networks, human mobility and dynamical processes such as epidemic spreading. Here we analyze data on the time-resolved face-to-face proximity of individuals in large-scale real-world scenarios. We compare two settings with very different properties, a scientific conference and a long-running museum exhibition. 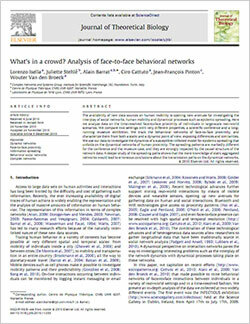 We track the behavioral networks of face-to-face proximity, and characterize them from both a static and a dynamic point of view, exposing differences and similarities. We use our data to investigate the dynamics of a susceptible–infected model for epidemic spreading that unfolds on the dynamical networks of human proximity. The spreading patterns are markedly different for the conference and the museum case, and they are strongly impacted by the causal structure of the network data. A deeper study of the spreading paths shows that the mere knowledge of static aggregated networks would lead to erroneous conclusions about the transmission paths on the dynamical networks.